Are you ready for Spring? I know I am and that was the inspiration for my first artistic endeavor for DecoArt's Creative Design Team for 2019. How about a Shabby Steampunk Birdhouse? With a little imagination, some junk metal pieces and DecoArt's fabulous Media line of products, you can transform a plain little wooden birdhouse into some funky and fun! Begin with a small wooden birdhouse. I purchased mine from JoAnns for $2. I loved the little propeller and that gave me the idea to add the steampunk flair to the house. Find all sorts of things to embellish your birdhouse. I used chipboard gears on all of the propeller blades, a metal Ornate Plate to “dress up” the birdhouse opening and I used cut off popsicle sticks to create more of a Victorian look above the door. Glue these things in place right onto the wood using a good clear drying glue. It worked great! I used double-sided adhesive tape to adhere my thin corrugated cardboard cut to fit the roof pieces. Paint DecoArt Media Gesso over the entire basic birdhouse. This not only will give you a base coat but it will also give a rougher surface for the items you are about to blue onto the birdhouse to adhere better. Let the gesso dry or heat set it. Add more elements to add much more detail to your birdhouse. On the backside, I added these little junk plastic circles I had along with the corrugated pieces that were left over from the roof. I also added the metal piece on the ridge of the roof. These were all glued in place. I glued the metal pieces on the front of the birdhouse to create the shabby style opening. Paint DecoArt Media White Gesso over the entire birdhouse again including the roof and all of the elements you've glued in place. Let dry or heat set. Choose a basecoat color for your birdhouse. In this case, I used Decoart Media Fluid Acrylics Vermillion Hue; a bright but deep orange color. I painted the roof with DecoArt Media Fluid Acrylics Carbon Black and lightly went over it with DecoArt Media Fluid Acrylics Metallic Silver. I want the roof to have a tin roof appearance upon its completion. 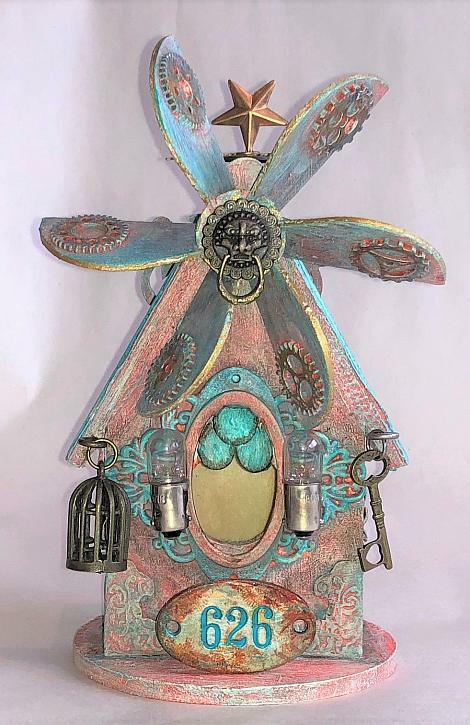 To dramatically change the appearance of the birdhouse and soften the color into more of a shabby chic look, DRY BRUSH DecoArt Media Fluid Acrylics Titan Buff over the entire house, including all of the embellishments you've glued in place. DO NOT dry brush on the roof. At this point, you can add more depth to your house and more of a shabby patina feel by adding DecoArt Media Antiquing Cream Patina Green to shade around areas. You can wipe it on and off with a baby wipe or paper towel or apply with a brush and remove the excess with a damp cloth or baby wipe. Since Antiquing Cream is water reactive, you can continue to add and remove until you heat set it or seal it. This little “626” oval was originally a brass piece. It is going to be the address marker on my birdhouse. I wanted to give it an aged, rustic patina look So using my finger, I rubbed DecoArt Media Fluid Acrylics Metallic Silver over the piece. Then I added some DecoArt Media Fluid Acrylics Quinacridone Gold to add the rust look and warm up the colors. Next, I mixed a little DecoArt Media Fluid Acrylics Titan Buff with Quinacridone Gold and tapped over the surface with my finger. I repeated all of these steps until I was happy with the base colors. Heat set to dry completely. Then I rubbed over the entire front of the piece with DecoArt Media Fluid Acrylics Cobalt Teal Hue and wiped it off with a dry paper towel, leaving the numbers filled in with the color. DRY BRUSH randomly over the raised areas of the birdhouse using DecoArt Media Fluid Acrylics Cobalt Teal Hue. This really accentuates the embellishments you've added to your birdhouse. Brush a light coat of DecoArt Weathered Wood over the surface of the corrugated roof. Let air dry. If you add a lot of Weathered Wood, you will get more crackling. I didn't want the “tin roof” to look like crackled paint on a wall but I did want to add just a hint of aging and wear. After the Weathered Wood is dry, quickly brush on a light coat of DecoArt Media Fluid Acrylics Cobalt Teal Hue. This gives a beautiful result of a dingy yet colorful tin roof. Finally, it's time to add a few more metal elements to your shabby steampunk birdhouse that aren't painted! I added two little eye screws on either side of the roof eaves and hung a little birdhouse and a key. I also glued two light bulbs on either side of the front door as well as gluing the “626” address marker in place on the wooden dowel rod sticking out from the door. I added a metal lion door knocker in the center of the propeller above the door. The little gears on the propellers were made to look more metallic by using my finger and wiping DecoArt Media Fluid Acrylics Metallic Gold over them. I also added the gold on the edges of the propellers using my finger to apply it. This photo also gives you a feel for the dimension this little birdhouse has. So fun! This is a closeup view of one side of the house. Both sides have these flowers that were added by gluing a piece of chain as a steam and a little metal flower and leaf in place before gessoing over the entire house and adding the orange and dry brushing with the Titan Buff. They were then highlighted with the DecoArt Media Patina Green Antiquing Cream. Here is another angle of the little birdhouse to show its depth and detail. DecoArt Media products make all of the elements just POP off of the wooden sides! And finally, here is the back of the house after going through all of the steps mentioned earlier. With Spring just around the corner, it's time to start thinking of new things you can create to decorate for the season. Little birdhouses are inexpensive and fun little trinkets you can sit anywhere to brighten up an area. Be sure to visit Creativity Is Contagious for more projects and to learn more about Candy Colwell. Candy - this is now my MOST FAVORITE piece you have created! Absolutely gorgeous! Love those colors!